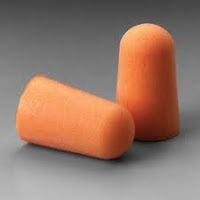 Home » tensor tympani » Human Ear Contains a Built-In "Ear Plug"
Human Ear Contains a Built-In "Ear Plug"
According to one Australian researcher, by just chewing a gum or singing/talking loudly, one could be protecting your ears from noise-induced hearing damage. How??? It is not common knowledge that the human ear contains two muscles that attach to the middle ear bones called the stapedius and tensor tympani muscles. The middle ear bones, composed of the malleus, incus, and stapes, are what transmits sounds from the eardrum to the cochlea which allows a person to hear. 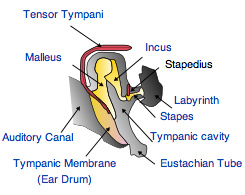 The stapedius muscle attaches to the stapes and the tensor tympani to the malleus. If something prevents the middle ear bones from vibrating, that effectively dampens the sound transmission from the eardrum to the cochlea... just like an ear plug or a bad case or earwax dampens sound transmitted through the ear canal to the eardrum. SO... if the middle ear muscles tighten which are attached to the middle ear bones preventing them from vibrating, less sound is transmitted to the cochlea... just like an ear plug, except it is built-in. Just how effectively does this reduce sound? According to the researcher who has been studying this phenomenon, by about 30 decibels (or 1000x fainter). That's about the same as foam earplugs! How does one "activate" the middle ear muscle contraction? By chewing a gum or singing/talking loudly! Some individuals can sense this contraction if they close their eyes and try to "pull the muscles around the ears together"... a fluttering sensation inside the ear may be heard/felt which is the contraction of the middle ear muscles. In rare patients, this contraction may occur involuntarily and continuously. SO... if you happen to have forgotten your ear plugs and are attending a very loud rock concert, chew gum and/or sing along with the band loudly! This may actually protect your hearing! Of course, it's better to wear hearing protection, or better yet, avoid such circumstances altogether. I've noticed I've been able to do this for years though while it isn't painfull it feels as stressfull as flexing any other muscle tightly. So, there is definitely a limit as to how long I can tense it voluntarilly. Therefore, it's not exactly the best option for input volume control. The tensor tympani in this picture is totally misplaced. Ears do this automatically when the noise is too loud. I often feel my ears clenching. It is a well known reflex, nothing new.